ENOUGH: Berkeley Conservative Student Sues Antifa Leader — Condition Yellow: Stay Alert. Stay Alive. Of the many Antifa terror cells operating throughout the U.S., perhaps BAMN is the most notorious. BAMN, which is short for "By Any Means Necessary" is a radical leftist group operating under the guise of 'anti fascism.' One of their biggest donors just happens to be militant leftist George Soros. Since the 90's, BAMN has gained notoriety for their pro-violence views and using heavy-handed tactics to shut down anyone they disagree with. In other words, BAMN is a fascist organization. Yvette Felarca, a violent leftist that teaches middle school children. 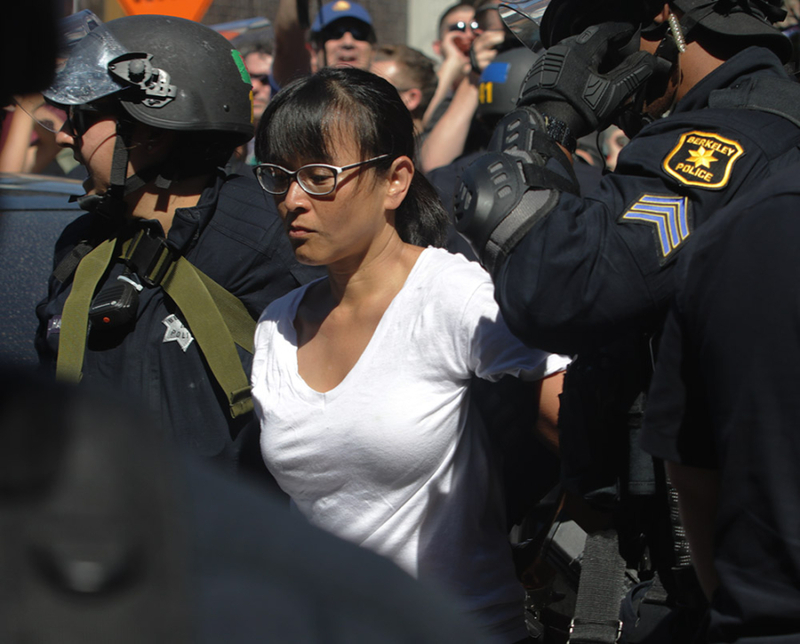 One of BAMN's most widely-recognized leaders is Yvette Felarca, a California middle school teacher with extreme far-left views. Felarca has participated in many violent riots on behalf of BAMN/Antifa and has proclaimed her approval of violence to shut down dissenting opinions. In the past, Felarca has been arrested for inciting a riot, assault, battery and resisting arrest. Now, one conservative student is fighting back in his own way. UC Berkeley isn’t a very welcoming place for conservative students. The “birthplace of the free speech movement” has been ground zero for the attacks on conservative speech on college campuses. One conservative has had enough and has filed a lawsuit against a leader in the Antifa movement. Berkeley College Republicans’ former president Troy Worden is seeking $100,000 in damages from Yvette Felarca, an organizer for national activist group By Any Means Necessary (BAMN). Worden claims that Felarca filed a “frivolous” restraining order against him which interfered with both his 1st and 2nd Amendment rights. This also made it difficult for the College Republican to walk through campus or attend his classes. Felarca filed the restraining order for stalking and intimidation against Worden on September 7. It was dismissed on October 26th. That’s a significant amount of time for Worden to be painted with Felarca’s accusations. Worden’s attorney Mark Meuser alleges the Antifa leader, who is also a middle school teacher, made false claims against the college student in order to file the restraining order. This 47-year-old middle school teacher believes she is entitled to harm the reputations and physically harm people who don’t subscribe to her far left agenda. Just like the name of her group states, she will try to suppress free speech by any means necessary. It’s rather unbelievable that a teacher continues these actions and remains in the classroom. Much like how clock boy's lawsuit against Ben Shapiro ended poorly, we look forward to seeing the outcome of Felarca's court battle. After all, Felarca is clearly unaccustomed to making rational arguments without resorting to violence.